Child Labour is a crime. When a child is asked or forced to do work that interferes and deprives him from his childhood activities like playing and studying. Childhood is a part of a human life in which he enjoy the pleasures of life and parents love and pampering, he is not supposed to be earning, making building, breaking stones at that very age. IWDI with the active help of Government of India and Tamil Nadu has weaned away a number of children who are in the field of child labour. The children thus weaned away have been provided with psycho social care support and are put in child labour school. The children have been educated in child rights, protection and child development measures and the welfare measures for their rehabilitation. Only a recognition of children as individuals with rights can pave the way for future action. Need Better Initiatives to Train Growing up Children to take responsibilities. It is worth saying that democracies begin with children and empowering children necessarily means considering children’s opinion valuable and listening and adhering to it. 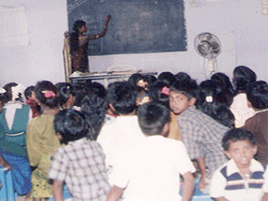 Since 2006-07, IWDI has been running 2 Supplementary Education Centres for Chennai Slum Children. 60 Poor School children undergoing 2 hours regular tuition class in evening times. It prevent drop out from schools. Around 150 children benefitted. IWDI designed and developed the materials which show the importance of education and dead evils of Child labour. It was designed such a way that illiterate can understand the concepts. Trained volunteers were identified in the village level, they identified the children who missed from the school and motivated the parents to enroll them into school and retention in the school. Specialized training was imparted to the Parents of identified child laborers, in the trainings importance of education was taught by the trainers. 4. Education sponsorship program for 25 deserved children. IWDI staff team identified the deserving students who is struggling to meet the expenses for their study, distributed the scholarships to the students. The students were selected from poor and destitute headed family. This programme was aimed to impart the special education to the children who are poor in education; the specially trained teachers have taken the classes in the evening time, during the class hour’s nutritious supplementary food supplied. This activity was aimed to promote functional literacy to the adult community, the basics of functional literacy were taught in the classes conducted in the villages. The export oriented tailoring classes were conducted to the adolescent girls, the duration for the course was six months. Nearly 100 girls benefited from this programme. The above mentioned programmes were supported by the generous support from ANANDA FOUNDATION-USA.